SNHR said today that the Jordanian government bears direct responsibility for the suffering of the residents of al Rukban Camp, noting that six civilians, including five children, died of starvation and sickness in one month at the camp. Al Rukban Camp is located on the Syrian-Jordanian border within the 55-kilometer demilitarized zone between the two countries, which is under the control of factions from the armed opposition, most notably Jaish al Maghawyer and Jaish Ahrar al Ashayer. The camp is located approximately 20 kilometers from the international coalition’s al Tanf Military Base. The 12-page report includes four accounts by residents who spoke about their suffering in light of worsening living and medical conditions, particularly since the start of 2018 when both the Jordanian government and the Syrian regime started impeding the delivery of aid to the camp. 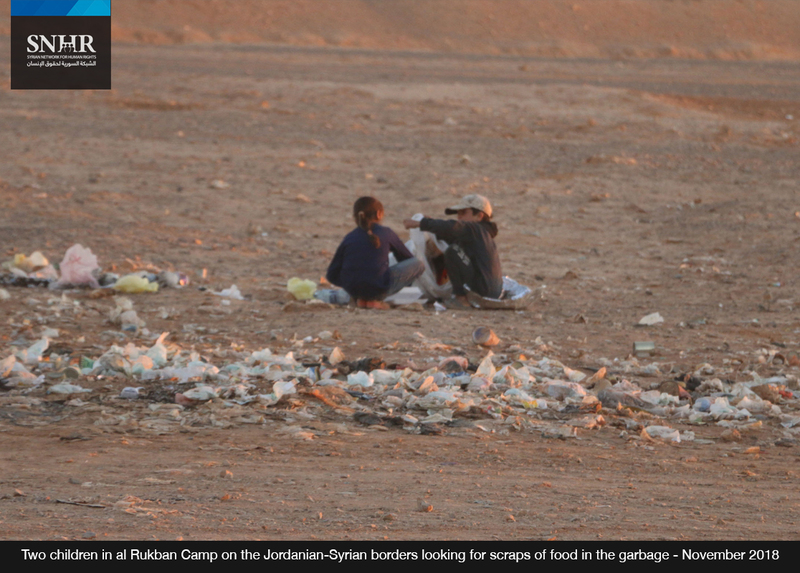 The report stresses that both the Syrian regime and the Jordan government bear responsibility for the suffering of al Rukban Camp. The Syrian regime is the party primarily responsible for the killing, and the indiscriminate and deliberate bombardment of all the areas that rose up against the continuing dynastic dictatorship of the ruling family and subsequently broke away from it. Also, the current Syrian regime is the party responsible for besieging and starving hundreds of thousands of Syrians in the past, in both Eastern and Western Ghoutas of Damascus suburbs governorate, as well as in the northern suburbs of Homs and a wide range of other areas. In addition, the Syrian regime has prevented the UN’s OCHA from delivering relief aid on dozens of occasions under ludicrous false pretexts. Moreover, the Syrian regime has ensured the appointment of individuals loyal to the regime in the OCHA offices in Syria. Even though the Syrian regime complied subsequently under pressure from external bodies, allowing Syrian Arab Red Crescent (SARC) teams to bring limited amounts of aid into the camp, the amounts provided were extremely inadequate and didn’t last for more than a few days. The report notes that any effort to liaise with the Syrian regime, which has killed and displaced millions of Syrians, in order to obtain continuing permission to aid the residents whom the regime itself displaced persecuted is a wholly worthless exercise. The report stresses that the Jordanian government is responsible, since it only needs to give the OCHA permission to deliver aid through its border and to respect Security Council Resolution 2165, adopted in 2014, which allows for cross-border delivery of aid. The report notes that the Jordanian government has largely restricted the process of bringing aid across the border, forcing relief workers to drop food supplies from the Jordanian side of the border using cranes. This has, obviously, greatly hindered and limited the delivery of relief aid, which has also been irregular and inadequate. The last time the Jordanian government allowed delivery of aid to the camp was back in January 2018. Since then, the residents of the camp have had to rely completely on food supplies smuggled from Syrian regime-held areas, which come at a hefty cost, resulting in a sharp increase in the prices of all supplies in light of the prevalent unemployment in the camp, leaving residents unable to secure their most basic needs. The report says that the deteriorating situation with respect to meeting the residents’ most basic humanitarian needs in recent years, which has become even worse over the past 10 months, has forced thousands of residents to flee the camp, with a proportion of those people forced as a result to return to areas under the control of the Syrian regime, while approximately 50,000 still live in al Rukban Camp as of the end of October 2018. The report notes that prominent figures from the camp and officers from Syrian regime forces discussed a proposal at the end of September 2018 which provides for the delivery of humanitarian aid to the camp, and the transfer of medical cases to hospitals in Damascus city. In addition, the agreement provided for settling the situation of the males within the military conscription age group or those who are wanted by Syrian regime forces. However, the residents, fearing any potential retaliatory acts or detention should they agree to such a settlement, refused. The Syrian regime’s response was to cut off the Damascus-Baghdad road, the only road leading to the camp, which meant that even the smuggled food and medical supplies have been severed. This barbaric siege, according to the report, has led to a dire scarcity of food supplies and a resultant sharp spike in the prices of the inadequate available food supplies, which has risen by 100 percent. The report stresses that attempts have been made to displace the al Rukban Camp’s residents once again and force them to return to areas controlled by Syrian regime forces. The report adds that applying pressure on the residents through starvation and deprivation of medical care in order to force them to go back to areas where their lives will be in danger, whether in the form of arrest, torture, or conscription, constitutes involvement in a war crime, especially after it has been documented that they refused the settlement proposed by the Syrian regime. The report stresses that the Syrian regime has impeded the delivery of relief aid sent by the UN from Damascus to al Rukban Camp, leading to a deliberate siege and starvation of civilian residents as a party to a non-international armed conflict. This has taken the form of collective punishment. According to the international humanitarian law, these acts constitute a war crime. Furthermore, the Syrian regime has, beyond any doubt, violated all the Security Council Resolutions on siege – Resolution 2139, adopted on February 22, 2014; Resolution 2165, adopted on July 14, 2014; Resolution 2191; adopted on December 17, 2014; and Resolution 2268, adopted on February 26, 2016. According to the report, Syrian regime forces have practiced the crime of displacement in a systematic, widespread, and organized manner against civilian residents in blatant violation of the Geneva Conventions. These acts constitute a crime against humanity according to the Rome Statute of the International Criminal Court. As has been documented, no measures were taken by these forces to secure shelter, medical care, or food for the displaced civilians. The report adds that the Jordanian government has repeatedly refused the many requests made by the UN to deliver aid to 50,000 individuals in al Rukban Camp which qualifies as contributing to the process of starving and punishing those individuals, and represents the imposition of massive pressure on them to surrender to the Syrian regime and to involuntarily return to the areas under its control, putting their lives in serious danger. The report calls on the Jordanian government to allow the UN to deliver aid to 50,000 individuals in al Rukban Camp in a continued and ongoing manner, and to facilitate passage through the Jordanian border for roughly 50 seriously sick individuals whose lives might end at any moment. The report urges the Friends of Syria to call on the Jordanian government to allow the UN to deliver relief aid through its border, and to work on thwarting the Russian plans to disassemble the camp and force its residents to return to the Syrian regime in order to subject the displaced men to conscription. Additionally, the report calls on the Security Council to act to save the lives of 50,000 Syrian citizens. Moreover, the report calls on the OHCHR to release a report documenting the violations against the residents of al Rukban Camp, and hold the responsible parties accountable for the lives of the Syrian people in that area. The report calls on the donor states and the OCHA to apply pressure on the Syrian regime and the Jordanian government in the media and in a political context in order to ensure that they agree to resume the delivery of relief aid, and to use the platform of the Security Council to achieve this objective. Lastly, the report stresses that the UN special envoy to Syria should shed light on this catastrophe in his next briefing before the Security Council, and explicitly and specifically name the people responsible.